Still, California’s uber-progressives led by San Francisco Senator Scott Wiener and his YIMBY shock troops, self-interested major tech corporations trying to off-load their needs onto the public ledger, academic think tanks, and an increasing number of powerful, “off ledger” quasi-governmental, unelected committees such as the Bay Area Council and CASA, The Committee to House the Bay Area, are united in their unwavering belief in centralized power and the market’s ability to produce socially equitable solutions. Their emphasis on “market forces” is no doubt the outcome of letting billion dollar corporate interests help shape their public policy beliefs. In truth, if markets or for profit developers had a solution to our affordable housing needs, they would have already built it. That’s how markets and the profit motive work. In the midst of all this, we have all the rest of us, most of whom fall somewhere in the middle, politically, and are socially liberal, but financially conservative, or at least practical, but who are summarily lumped together and labeled obstructionists, NIMBYs, racists, entitled, selfish “rich” people, and worse, even though the vast majority of us are none of those things in any way shape or form. The great challenge for the rest of us, which includes the dwindling middle class and the poor, is that we are not all in agreement about any one, overly simplistic, ideological solution to everything, which turns out to be a big disadvantage when dealing with fervent ideologues. As a group, we still like democracy a lot. And we love our towns and cities and take pride in them. And most of us have more to do with our lives than waste it on viewing everything in life only through a highly politicized lens. While uber-progressives incessantly demand more state government intervention and less say about how our tax money is spent, the rest of us are begging for relief from unachievable and economically unrealistic top down government mandates and more help with solving our very real, day to day problems of overwhelming traffic congestion, inadequate public transportation options, fixing our infrastructure, combating environmental degradation, and keeping our schools and public services from being cut to the bone. Apparently, the CASA crowd has never heard of irony. We’re asked to give all that money to unaccountable government agencies and committees and private for profit interests, who will, of course, spend it wisely, sans any political influence, or perhaps more likely, spend it on the agendas of those who have the greatest political influence. But the worst thing about all this is that this whole discussion, again, misses the point. CASA and Senator Wiener ask us to accept that all that ails us is a “housing crisis.” I wish it were that simple. This belief is incredibly naïve and ignores the long wave socio-economic factors that are driving our markets, our tax revenues, and our lives, and consequently impacting affordability. It ignores the impacts of globalism and the speed of capital around the world. When those factors are considered, it becomes clear that what we’re experiencing is not just a housing affordability crisis but an overall affordability crisis everywhere in this country. The crisis is one of affordability of a decent standard of living, not just housing. 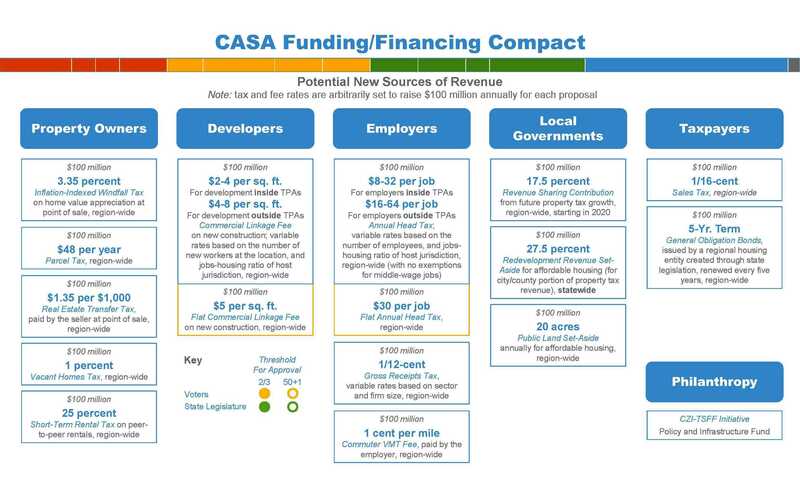 But before we go into all that, let’s take a look at the so-called “CASA Housing Compact,” the super tax “plan” to achieve affordable housing and social equity, which is currently being rammed down the throats of our seemingly oblivious locally elected officials in Marin. I'll examine the original proposal and the newly revised version. As noted in my recent article, The Committee to house the Bay Area and the coming tax tsunami, the CASA Housing Compact, as originally proposed, consisted of 16 major taxes and fees and assessments to fund a massive transfer of wealth from the private sector and local government to regional and state agencies. How that money would be managed and spent is not explained. It’s just “give us all the money and trust us.” The lack of accountability aside, the overall impacts of this cannot be under-estimated and, unfortunately, have not even begun to be investigated. Even though the original CASA proposal has been revised, as discussed below, I want to go through the original proposal just to show the audacity of the kind of thinking we're dealing with. This chart is the original plan for the CASA Housing Compact. To help illustrate how absurd the impacts of the original proposal for the CASA Housing Compact were, in a way that is tangible to the average resident, let’s analyze that plan using an example of how it might affect housing in just one small city, Mill Valley. The most recent US Census indicates that there are currently about 4,000 single family homes in Mill Valley and the median price for a home is about $1.5 million, and about 2,000 condos and the median price is about $800,000 each. That means the total estimated value of the residential, for sale real estate in Mill Valley is currently about $7.6 billion. For each Mill Valley home then the proposed CASA Housing Compact will add a housing sales tax of 3.35% on "home value appreciation" and a 1.35% per $1,000 in value transfer tax, both at the time of sale/purchase. Let's assume this tax started running today and assume that the average forward appreciation rate on housing prices is 4%, which is much lower than it actually has been these days, but closer to the very long term historical averages. Now let's use the current average rate of housing turnover rate in California, which is about once every 9 years. That means that the $7.6 billion in value would result in $416 million in appreciation subject to the CASA 3.35% in that 9 year period. That equates to about $14 million over 9 years, plus 1.35% per $1,000 in value, or about $190,000 for a combined total of $14,190,000 in new taxes. Market economics dictate that all things being equal (no booms or busts), this amount will be added to the purchase price and passed on to buyers. And because housing “valuation” appraisals are based on appraisals on recent sales figures, these new taxes and fees will immediately have an impact on the entire housing market, which will quickly adjust up to the new price. This means that the proposed CASA Housing Compact sales tax fees would have potentially raised the total appraised, for sale, residential real estate values in the City of Mill Valley by $14 million of guaranteed housing price inflation. For good measure, CASA then added a $48 per year homeowner’s tax, which equates to another $288,000 tax burden per year, every year. The obvious question is how can that possibly lead to greater housing affordability? Increasing taxes does nothing to help the income side of the equation. In the past months, it appears at least some semblance of sanity prevailed and the latest version of the CASA Compact has removed the taxes on home values and sales. It left the $48 per year parcel tax on all homes and left a ridiculously difficult to assess 1% tax on the assessed value of vacant homes. 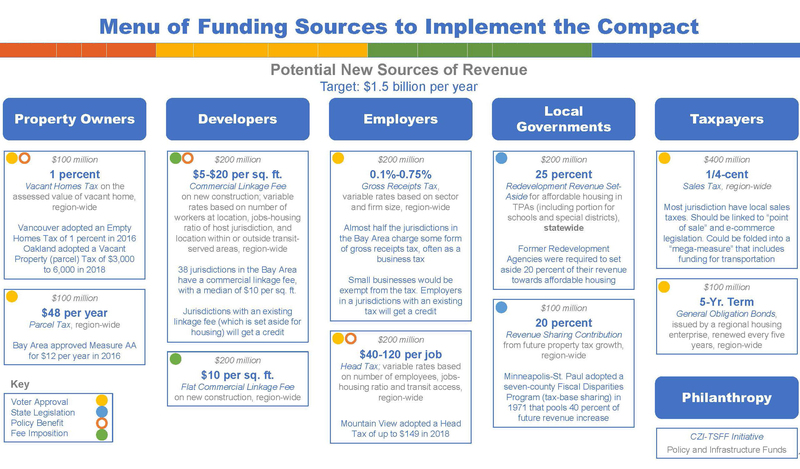 This chart is the current plan for the CASA Housing Compact. However, even the newly proposed CASA Housing Compact still doesn’t stop at taxing homeowners. It goes after all types of development and businesses and finally turns its sights on local government itself. Wow, that should convince a lot of business and jobs to stay in the Bay Area, right? All this considered, you would think the CASA Housing Compact would take into consideration that towns and cities provide extremely important services, all of which are fundamental to the health, safety and welfare of their residents and that unlimited development will weigh heavily the ability to provide those services. But you’d be wrong. The CASA Housing Compact funds collected do not go to your local government. As such, the CASA Housing Compact’s authors seem oblivious to such mundane concerns even though a well-run city that provides reliable public services and has good schools and well-maintained infrastructure are things investors and housing developers look for when deciding where to invest and build. It doesn’t take an accounting degree to conclude that this would quickly deplete the funding available for public services in every city in Marin three times over. We live in a consumption driven economy and that is a major component of local tax revenues. Every single one of the taxes, fees and penalties proposed in the CASA Housing Compact are ultimately “regressive” and/or economically debilitating. Those who are the poorest or hanging on the last rung on the middle class ladder will be hit the hardest, which means they will have less to spend on basic necessities and everything else, including housing, which will drive down sales tax revenues. And in a market driven economy (versus government built housing), if there are only "x" dollars that can profitably invest in housing at any given time, based on real demand, how can there be more funding available for housing development if the government has inserted itself as a middle man in the aggregation of capital and siphoned off a considerable percentage of those funds for its administrative and planning costs? Wouldn't it be better to just offer tax incentives directly to private capital, to build affordable housing, rather than creating yet another bureaucratic mega-agency and taxing those who actually create capital... all of us who work for a living? Overall, there’s no question that one of the long term results of CASA's wasteful confiscation of private capital will be increased wealth disparity. Does this mean that taxes and fees are categorically a bad thing? Not at all. It’s just that taxes have to result in a positive feedback loop on the income and credit availability side, whereas the CASA Housing Compact is more like an animal eating its own foot in an attempt to get out of a trap, because it’s willing to ignore that it will be a cripple for life afterwards, just to survive another day. Lawrence Yun, the Chief Economist of NAR, at the Realtor’s Summit in San Diego, CA. Besides the Great Recession of 2008, another reason for this is that more and more people cannot really afford the house they presently live in, if they had to purchase it today. So many residents are "stuck" in their homes, which decreases the number of homes available for purchase. This is why the average home purchase to resale cycle has doubled in the past ten years in California.